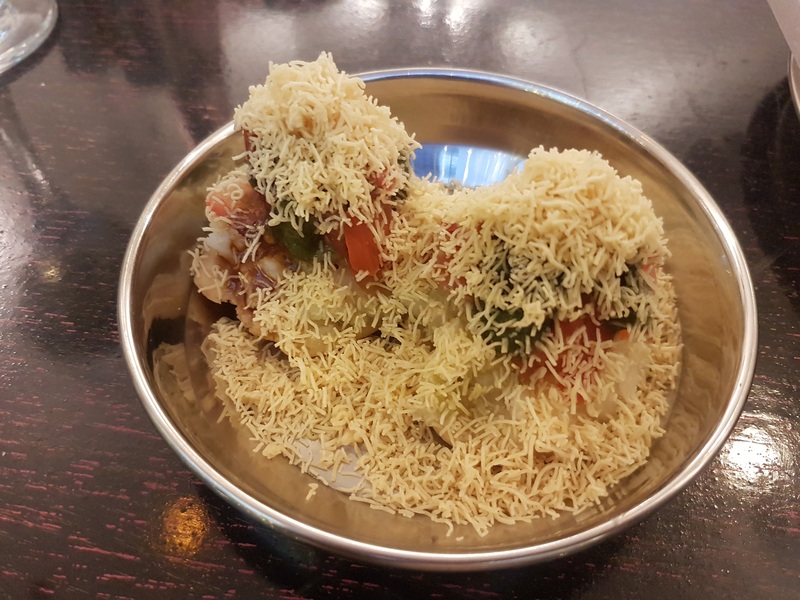 Bwyta Bwyd Bombai, otherwise known as the 3Bs cafe, is one of the very few – if not, the only – places in Cardiff where you can order truly authentic Indian street food. I was lucky enough to be invited for a taster evening, celebrating a year since the cafe first took residence in Cardiff’s High Street Arcade. We kicked off with a bang. Some ‘puri’ samples; bite-sized canapes that exploded in your mouth, perfect little starters and something a bit different. The sev puri was full of flavour – topped with potatoes, onion, tomato chutney and a garnish of crispy gram flour vermicelli or ‘sev’. The dahi puri was a little less like the Indian flavours I’m used to. 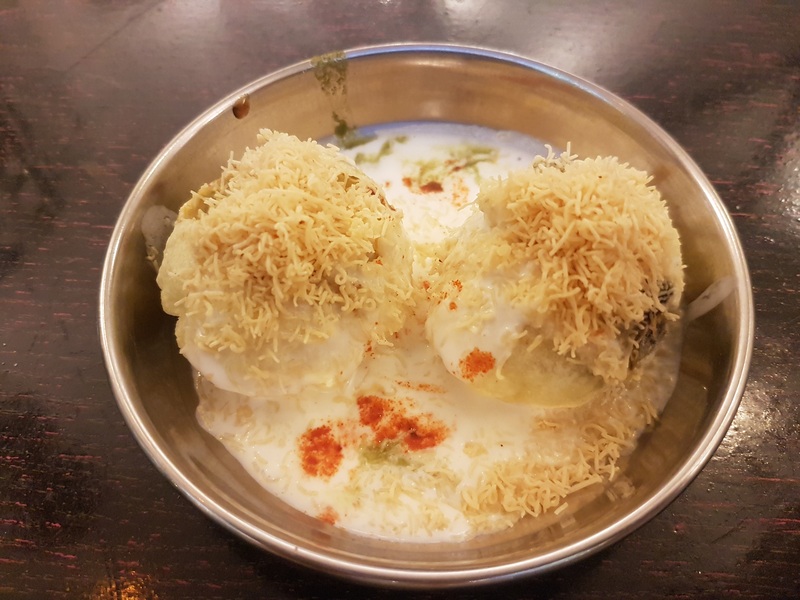 Topped with crispy sev, these had an intricate combination of textures and temperatures, the heat of the chutneys and cooling sensation of the yoghurt. Definitely worth a try. Following on from that I was served up a mixed plate of bhaji, which featured traditional onion bhaji, spiced potato dumplings also known as Mumbai burgers, and my newly discovered bhaji favourite – spinach. These were simply raw leaves of spinach crisped in spiced bhaji mixed, and as odd as they sound, they were bloody delicious. Next was to sample a selection from the mains. I tried the chicken dosa, a filled crepe made from lentils and rice batter served with chutney and sambar. Surprisingly light, packed with Indian flavour, and filling. Finally, with my waistband bursting at the seams, I managed to squeeze in a small sample of chole pattice. This consisted of shallow-fried mashed potato and green pea patties, topped with chick pea curry, chopped onions, coriander and chutney. A deliciously authentic curry substitute for the usual chicken tikka masala or korma or madras which we’re so used to seeing on Indian menus. Yes, the food was fab. But satisfied tastebuds and a full stomach wasn’t the only thing about 3bs which won me over. The lovely owner, Shakshi, met me with a warm welcome. She was brought up in Mumbai and, after relocating from London, she brings all of her wonderful home cooking to the menu. Shakshi talked me through the dishes and ingredients in great detail, and with a passion that only comes from someone who truly cares and takes pride in what they’re serving up. She assured me that many of the dishes served up that night were only sample size. To my mind, they were full portions. The lesson here is that you get more than enough bang for your buck. And the buck isn’t ££ either. Pretty much everything on the menu was under £10 – in fact, much of it is around the £5 mark. And fortunately, mostly for those of you who don’t work in the centre of Cardiff, High Street Arcade is open until 8pm on Thursdays and Fridays, so you could even skip lunch and pop in for an early evening meal. Three words. Banging bombai bwyd.